"The Lodge That Wouldn’t Die!" 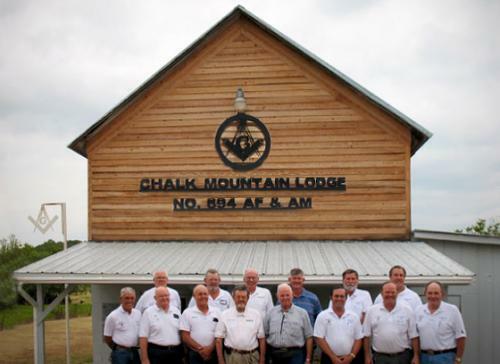 Chalk Mountain Lodge Number 894 began work under dispensation from the Grand Lodge of Texas on July 30th 1904. The lodge was set to work by R. W. John J. Ray D.D.G.M of the 36th district of the Grand Lodge of Texas, with Joe Dotson as the first Worshipful Master. There were nine members present and 31 visitors. The lodge was chartered to work on December 8th 1904. The stated meetings were set for the first Saturday night on or after the full moon. The meetings were set to coincide with the full moon as the members either walked or rode to the meetings on horseback. The light of the full moon made it easier for them to see their way home after dark. From 1904 to 1946, only 21 Masters served the lodge with many serving more than one term. At the May 30th 1953 meeting, a bill of 14 dollars was paid for the last set of oil lamps purchased, prior to the use of electricity, in the lodge. At the stated meeting of April 9th 1955, the lodge voted to send one of these oil lamps to Waco to be placed in the Grand Lodge Museum. The original building was designed and built, by J.H. Underwood, a member of the lodge. The first floor was used as a grocery store and the second floor housed Chalk Mountain Lodge. In 1908, Brother Underwood gave the ownership of to the property to C.C. Hammock, with Chalk Mountain Lodge retaining ownership of the second floor lodge. In 1916 Mr. Hammock turned the deed of the property over to D.W. Lacky. In 1935 D.W. Lacky died and the store closed down. The lodge members continued meeting in the building at the original location until 1989. A dispute with the Underwood family descendents who had claimed ownership of the land led to the decision to move the second floor lodge. The lodge owned the second floor but not the first floor or land that it was built upon. Negotiations to buy the property the lodge was built upon were unsuccessful. Mr. Stacy Bright of Weatherford a non Mason donated a 1 acre lot to Chalk Mountain lodge. A foundation was poured and a concrete block lower first floor erected at the new location. On May 6th 1989 members of the lodge and other area Masons, along with considerable help from Shinn Construction Company Inc. and its workers cut loose and lifted the second floor lodge building and moved it ¼ mile away and set it on top of the new building. The lodge has become known as the lodge that wouldn’t die, and continues to meet on the Saturday on or after a full moon. The lodge members stay involved in the surrounding community. The lodge provides Thanksgiving Dinners and Christmas Dinners to local families as well as supporting activities at the Three Way School.